The figure used for this unit is a Heroclix figure from the Clobberin' Time set. Its model number and name are #094 / Mr. Fixit. 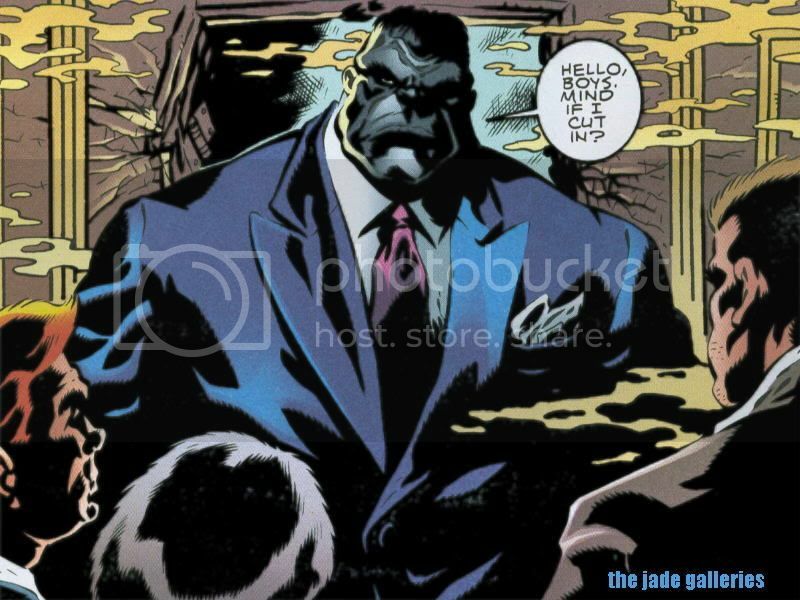 Character Bio - The first appearance/emergence of the Hulk was gray and only transformed from Banner to Hulk during the night. Later, thinking the Hulk dead, this incarnation of Hulk was able to escape to Las Vegas, working as a 'leg-breaker' for a casino owner. He remained free of Banner for months and developed a life all his own until the transformations returned and he was fired from his job. The Grey Hulk is cunning, intelligent , arrogant , crafty, hedonistic, and distant with a hidden conscience. Using Super Leap will NOT lower the attack die on Machine Gun Special Attack, allowing Joe to use both abilities in the same turn. As a Mutate, Joe Fixit has these Mutate Synergies. As a Bruce Banner figure that is not a Scientist, Joe Fixit may be drafted into an army with Bruce Banner due to his Secret Identity special power and may be switched with Bruce Banner due to his Monster Within and Puny Human special powers. If Joe Fixit is drafted with Bruce Banner and does not start the game on the battlefield, he gains these Off-the-Battlefield Synergies. As a figure with the Super Strength special power, Joe Fixit cannot be affected by aspects of certain special powers: Special Powers that Interact Differently with Super Strength. As a figure with the Super Strength special power, Joe Fixit interacts differently with certain special powers: Special Powers that Interact Differently with Super Strength. As a figure with a Special Attack, Joe Fixit can be affected by aspects of certain special powers. Current Special Powers that Interact Differently with Special Attacks. Last edited by Ronin; July 16th, 2018 at 02:18 PM. If Joe Fixit’s Machine Gun Special Attack inflicts a wound, he may attack again with his Machine Gun Special Attack. 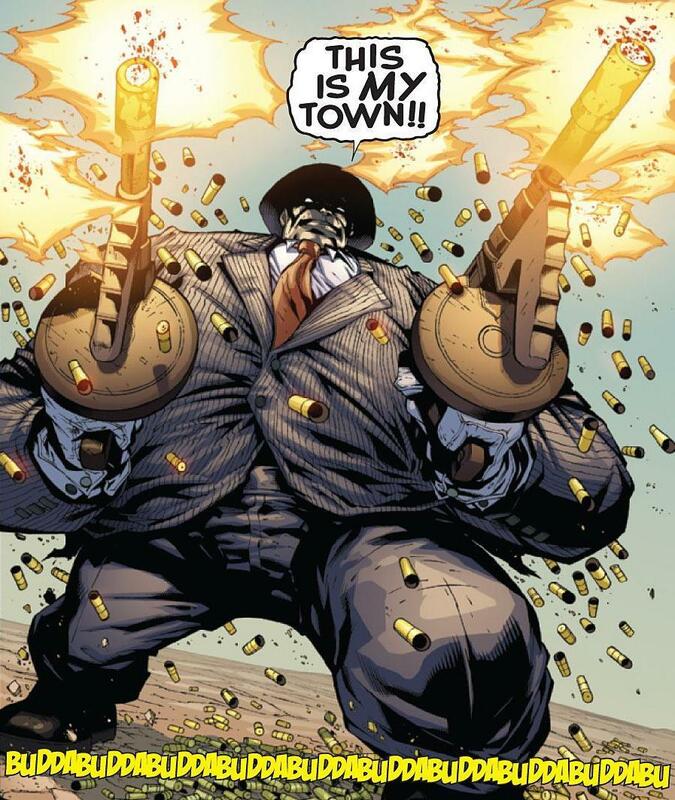 Joe Fixit may continue attacking with his Machine Gun Special Attack until he does not inflict a wound. He may not attack the same figure more than once. Whenever Joe Fixit is attacked with a normal attack from an adjacent figure and takes no damage, you may choose up to X empty spaces in a straight line from the attacking figure and place the attacking figure on any of the chosen spaces. X is the number of excess shields rolled. A figure moved by Bounced cannot be placed adjacent to Joe Fixit, never takes any leaving engagement attacks, and can receive any falling damage that may apply. Instead of his normal move, Joe Fixit may Super Leap. Super Leap has a move of 10. When counting spaces for Joe Fixit’s Super Leap movement, ignore elevations. Joe Fixit may leap over water without stopping, leap over figures without becoming engaged, and leap over obstacles such as ruins. Joe Fixit may not leap more than 50 levels up or down in a single leap. When moving with Super Leap, Joe Fixit will take any leaving engagement attacks. Joe Fixit rolls 3 fewer attack dice on any turn that he chooses to Super Leap. Last edited by SirGalahad; April 28th, 2014 at 12:08 PM. There were two other powers that were being considered, but I was a little worried if all four powers could fit onto one card. Joe Fixit cannot be switched with any other Bruce Banner figure you control if he is on a Shadow space. Add 1 additional die to Joe Fixit's attack while he is on an asphalt or concrete space. One possible fix for this is just getting rid of Super Leap and replacing it with the two above powers, but then I'd be worried about it not feeling like a Hulk design. EDIT: Although actually, after checking, all four powers can fit on one card. It's a little cramped, but doable. Last edited by Flame Gryphon; June 10th, 2013 at 03:38 PM. When rolling defense dice against an adjacent attacking figure, all excess shields count as unblockable hits on the attacking figure. If one or more unblockable hits were inflicted on the attacking figure, add an additional unblockable hit on the attacking figure for each wound marker on this card. Or you could just reuse Rage Enhanced DNA. ... assuming that's not too much. I'm not much of a fan of Night Person (he's not limited to transforming at night anymore) or Street Fighter (it fits but Hulk goes beyond that IMO). I'm not a huge fan of Payback... Counter Strike is a finesse power and Joe Fixit isn't the most finessed guy. Finesse? He's a bouncer. He stands in front of you and says, "Go ahead. Try something." Then when you try, he has the capapbility of hitting you really hard. I'd like a shortened (and less powerful) version of Payback. I don't particularly care for Night Person because it doesn't do anything worthwhile in gameplay, IMO. And I think Payback works better as a gangster themed power than Street Fighter. The two powers currently in the SP are my favorite two and I hope they're keepers over anything else. When rolling defense dice against an adjacent attacking figure's normal attack, if you roll any excess shields, you may immediately roll one unblockable attack die against the attacking figure for each Wound Marker on this card. Isn't that an out of turn attack though? When rolling defense dice against an adjacent attacking figure's normal attack, if you roll any excess shields, you may immediately inflict an unblockable hit against the attacking figure for each Wound Marker on this card. Is a leaving engagement attack an out of turn attack? "roll unblockable attack dice" =/= "attack phase." I worry about the power level of auto wounds like that (Other than Puppet Master, Jocasta is the biggest released unit in the game I worry about for the sake of reevaluations for just this reason). Against mid-level heroes, they could whittle him down to 1 life and then he could end up annihilating them left and right.